The sharp shock is transitioning into a dull ache, and the realization is setting in that this could be a long haul. We need to think about a long-term approach to helping our boys. The main strategy in maintaining awareness about the situation appears to involve spreading the slogan "#Bring Back Our Boys." Personally, I have to say that I dislike that slogan on a number of levels (which may relate to my being British, I don't know). I feel that it is trivializing the most serious of situations, reducing it to a soundbite and an internet meme. But it seems that in a world that has become enamored with Twitter, Facebook and hashtags, and which has a short attention span, this is the way to develop and maintain awareness. Being very pedantic/ yekkish about precision in language, I also think that the formulation of the slogan is not necessarily ideal. It was lifted from the slogan #Bring Back Our Girls, developed in response to the tragic kidnapping of 200 kidnapped Nigerian girls. "Bring back" is a request, or command, directed to others. I don't know who invented it, but my understanding was that it was directed towards the West, to bring about political/military pressure to rescue them. When I saw the famous picture of Michelle Obama holding the sign, my first thought was, "Who is she talking to? Her husband?" Yet it's become an effective succinct way to raise awareness in the wider world, and as such, "#Bring Back Our Boys" is a valuable slogan for our global campaign. But what about when it is not a matter of raising global consciousness, but instead when we are talking amongst each other? I don't think that "Bring Back Our Boys" is the best way of phrasing it. As religious Jews, who exactly are we addressing when we say "Bring back our boys"? It makes most sense to be addressing Hashem, but then it should be phrased as a plea rather than a demand, and it's inappropriate to be doing so with a picture of a sign with a hashtag. At the same time, I think that it is important for all religious Jews to be aware of how we hope Hashem to bring them back. I formulated a prayer, with which I have been signing off my posts, which says "Hashem, please help our soldiers bring our boys back home." Someone criticized this, telling me that I shouldn't be dictating to Hashem how He should bring them back. But I think that it is important to be aware of how we hope and expect it to happen. Obviously it's not going to be via Hamas having a change of heart. It could be via the political method of a prisoner exchange, but that is far from ideal, and isn't even on the cards at the moment. What we are really hoping for is for the IDF to perform a spectacular rescue mission, like they did in Entebbe (but without any casualties on our side). And we should remember that it is the soldiers of the IDF who are currently engaged in the difficult and dangerous task of combing through Palestinian areas to find our boys. Our prayers to Hashem to save our boys should simultaneously include a prayer for Him to help those who are making the most important and demanding efforts in this direction - both in terms of the success of their mission, and also for their own innate protection and benefit. Still, as noted, for the wider global campaign, something universal and brief is required, and the slogan "#Bring Back Our Boys" has been adopted. As I understand it (and I am very new to this whole social media phenomenon), it is considered helpful to post this slogan everywhere, and to post pictures of people holding signs of the slogan in as many diverse locations as possible. (I've seen some pictures in which the children holding the sign are smiling, which seems very inappropriate.) I've also seen people tie three yellow ribbons to the gate of their homes. It might seem like clutching at straws. But when three of our children have been taken, we will clutch at every straw we can find. Amidst everything we do, we say Hashem, please help our soldiers bring our boys back home. I said a few days ago that Right and Left agree on how to intially save these boys. I think that still holds true, but if G-d forbid, this thing drags out, we should consider whether or not draconian measures might not be appropriate. For example, announce, point blank, that if any of the boys are harmed, we will execute 1,000 Palestinian prisoners currently sitting in Israeli jail (who should've been executed in any event years ago). I think this would change the game. Instead of Israel being weak (in the Arabs' eyes), it would be strong and would place the ball in the Arabs' court. Suddenly, there would be a price for kidnapping. There are other innovatice ideas that could be tried (perhaps releasing prisoners in buses and then blowing up the buses) after the teens are released. The point is to stop being at the Arabs' mercy -- to let them know that there will be a very steep price for such incidents henceforth. One thing the Arabs understand is most defnitely strength.
" For example, announce, point blank, that if any of the boys are harmed, we will execute 1,000 Palestinian prisoners currently sitting in Israeli jail "
What a silly suggestion. It's not going to happen, so why even bother talking about it? It's not an uncommon reaction, but it is not going to happen. Israel does not have a death penalty, and it is not about to introduce one. To do so as a tactic is not consistent with the values of the society that we are trying to build here. I know that David HaMelech did something like that once, but the Tanach does not give it unambiguous approval. So kal ve'chomer for our era. 1) One should never voice a (hysterical & utterly impractical, in this case) threat that one will not, and/or cannot, make good on. 2) What should we do? Line them up on the edge of a long ditch 1940's-style & give each one a bullet in the back of the head? 3) To do so would be to show that we're no better than our enemies. Call me a racist but I happen to think that that we're alot better than them. 4) Do you really think it would work? "Call me a racist but I happen to think that that we're alot better than them." Seriously, how are we better than them? When we went "crazy" in Gaza just 5 years ago, killing 1400 men women and children to "teach them a lesson", was that being better than them? It was to prevent them from firing rockets at civilians, and we tried (harder than anyone else in the history of war) to avoid civilian casualties, so yes, we are better than them. But let's not get off-topic. 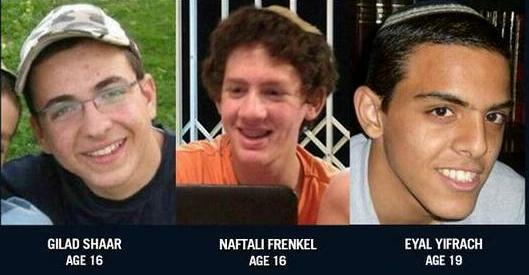 I have seen #PrayForOurBoys, and the IDF has #EyalGiladNaftali (http://www.idfblog.com/2014/06/18/speak-voice-share-story-eyal-gilad-naftali/) It seems that at the very least, the IDF needs the public support for the justice of their mission. As for whether or not G-d would get sufficient credit if the IDF succeeds, I am really not worried. When, be"h, each family makes a Seudat Hodaya, they will also thank the IDF wholeheartedly. I don't like about this slogan what I didn't like about the "Free Gilad Shalit" slogan: Who exactly is it addressing? The terrorist kidnappers couldn't care less about our slogans. Out government & security forces are already doing their utmost to free the abducted youths. Hashem will do what He will do in any case. So, who is it addressing? "Free Gilad Shalit" was mistakenly aimed (horribly so) at the Olmert & Netanyahu governments, and helped lead to the awful exchange deal, the rotten fruit of which we are now seeing. Is the slogan aimed at raising public awareness? So what? As my Dad would say, "That and 50 cents will get you a cup of coffee." Raising public awareness, or not, is utterly irrelevant to saving the abducted youths. So, who is the slogan aimed at? Us? To give us the impression that we (as opposed to the IDF, ISA, Border Police, etc.) are doing something? Prayer & Torah study are the best things we can do. So, who is the slogan aimed at? Anybody? I agree that we cannot tell Gd how to do His miracles, even b'derech hateva. Please, HaShem, give all of us the courage to stand up for our own people and our own children. Please give our politicians the intelligence and wise counsel to make right decisions to bring back our boys, in a manner that does not lower our standing in our own eyes or in the eyes of the nations of the world..
And give our religious leaders the ability to motivate us all to use this as a springboard for many personal and national improvements in our connections to each other, to our land and to Gd. I end most petitional prayers with, this is my idea, if you have a better one, let's go with yours. "As religious Jews, who exactly are we addressing when we say 'Bring back our boys'? It makes most sense to be addressing Hashem, but then it should be phrased as a plea rather than a demand." To hell with that. Let's demand it. I've seen enough tragedy in my life to realize that pleas don't do squat. How did Moshe Rabbeinu get results? By asking Hashem for pity? By arguing that the Bnei Yisroel aren't really that bad? No, he appealed to Hashem's image. Hashem, do you want the world to think You couldn't bring Your people into the land? That's what worked. Why don't we have tefilos that echo that approach? We should. Hashem, the whole nation is davening for this. Do You want us to think You don't care? Because that's where we're headed. This will be a PR disaster for You if You don't rescue these boys. There are people davening to You who will never daven to You again if this doesn't work out. Is that okay with You? That's my angle. In your text, "Hashem, please help our soldiers bring our boys back home." why are you limiting their salvation to excusively coming through Israeli soldiers? As long as the boys are brought home safely, who cares how they are rescued? Of course Israeli soldiers also deserve prayer on their behalf for all missions they are on, including this one. I would prefer the text that chazal have written in Acheinu etc. "May Hashem have mercy on them and release them from captivity to freedom." I explained all this in the post! 2. We should be giving credit and support and prayers for those who are engaged in the difficult task of trying to rescue them. 2. I agree, but our support and prayers for Jewish soldiers are for all missions, so there is no need to specify. I can personally think of a few options besides the IDF. 1. The boys themselves stage an escape. 2. Infighting amongst the terrorists leads to one freeing them to spite the other one. 3. Malfunction of the security apparatus guarding them. See, three options right there, and none as far-fetched as humans descending from apes! R. Slifkin: "Hashem, please help our soldiers and please bring our boys back home" addresses your points, 1 & 2, without precluding other possible ways of their being saved. How about Hashem, please help Your people achieve peace with the Palestinian people. Because realistically the hatred and steady stream of deaths and abductions not going to end until the Palestinians achieve their tikva of being a free people in their own land. I see nothing realistic in what you say. So do you fall in the more realistic genocidal camp or in the more realistic continue the undemocratic occupation and they'll give up camp? Cause both are dangerously fanciful. No, I fall in the realistic "continue the current terrible situation until there is an alternative which is less terrible" camp. There's certainly nothing realistic in thinking that things will be better if they have a state. As the Arab said to the Brit in 1947. To which I would respond with one word. Why? Could you clarify whether you are a "the Palestinians are congenitally incapable of peace" racist or otherwise clarify why you are so sure that a peaceful accommodation of their desire for statehood is impossible. What makes you sure that their desire is solely for a State, and not for the extermination of the Jewish state? What point? I don't see any comments from you on this post. I hope you will reply to my point, R. Slifkin. I fear the onus of explanation is on the accuser of "cultural incapable of peace" to explain the basis for this conclusion. When the hagganah blew up the king David hotel was this because they had a tikvah or because they were culturally incapable of peace? When you place a nation under military occupation for fifty years and they run a terror campaign is this intrinsic to them or to the circumstances they find themselves in? Are you serious? Don't you see what is going on throughout the whole Middle East? Brother Muslims and Arabs who all love one another are butchering each other? How do you explain that. Of course it is cultural, just like it was cultural for European Christians to do the same thing with their continent-wide civil wars including the "30 Years War" in the period 1618-1648 and then again the European Civil War which basically lasted from 1914 to 1945 with a temporary break in the middle. (BTW-Shabbat marks the 100th annivesary of the assassination of Archduke Franz Ferdinand and his wife in Sarajevo which set the whole thing off). Why do you assume that everyone in the world is basically a reasonable, rational, peace-loving person like yourself. I hate to be the one to break it to you but that isn't the case. Mr ben David posits a world of Darwinian struggle between nation. I agree to an extent, but I would also point to the extended periods of peace. My model of international relations is that of a playground with no teacher. Some kids will continue mutually beneficial colouration and play. Some will bully. Misunderstandings will get out of hand. There will be violent confrontations. But there is no inevitability of a stasis of permanent and indefinite conflict that Rabbi Slifkin has implied. It smacks of complacency - and lack of empathy with the palestinians who have are under undemocratic military government of a foreign power now and have been for the past fifty years. That's the reason why the Arabs are stuck in a naqba - because we refuse to let them vote for their own rulers. There is nothing inevitable about our conflict. If France and England can move on; and the French and Germans reach a settlement, and Croats can make peace with Serbs etc then we can one day make peace with the Palestinians. It is not unrealistic, it is pragmatic and even inevitable. If I was prime minister of Israel I would recognise the state of Palestine today, probably be forced into declaring war on them within a year,, and reach a lasting peace in maybe 10 years time. I don't like about this slogan what I didn't like about the "Free Gilad Shalit" slogan: Who exactly is it addressing? 1) Those directly affected and their families. It gives them strength and comfort to know that people are thinking about them and praying for them. In this case, while we can't know, the information may even be getting through indirectly to the boys themselves. 2) Those involved in search/rescue. It gives them the feeling that they are doing something that others care about. 3) Those that make the decisions. It puts pressure on them to spend their time and political capital on the subject. One can imagine that this may be one of the reasons why public prayer is considered to be of higher value than private prayer. Jewish girls are lured in to Arab villages by terrorists, often pretending to be Jewish. Over 300 have already been rescued and over 570 more are still being held captive. This is what is claimed by Learn and Live, http://www.learnandlive.org.il/ A Jerusalem based Jewish organization devoted to the rescue of these girls. It is possible that before Hamas announces to all that they indeed have captured our boys, they first need to smuggle them out of the West Bank. This would be one reason why the IDF is so frantic in finding them. Are they searching for our girls as well? Our concerns must be for all who are captured. And we must demand the return of all who are held by the terrorists. It triggers personal awareness, a love and comfort for the boys & families and gives strength to all individuals who are involved physically with the search and rescue mission. your tefila "Hashem, please help our soldiers bring our boys back home"
is a beautiful shvil hazahav between those who unfortunately subscribe to Kochi V'ozem Yadi and those who unfortunately subscribe to the passivity of "it's all bashert"
The Bring Back Our Girls meme was mainly intended to pressure the Nigerian government to get involved in saving their own citizens, and that was to whom Mrs. Obama was (if indirectly) directing her missive, as everyone else was. It had some success in forcing Nigerian president Goodluck John to at least address the issue. The Bring back Our Boys meme is intended to pressure the international community to in turn put pressure on Hamas or whoever is behind the kidnapping. I have no problem with the text of your prayer. When a family is in financial distress and the main wage earner is unemployed, I am sure that their prayer is put in the form "please help my father find a job" and not "I pray that a pot of money will fall on my doorstep". A lot of soldiers are making a major effort to find them in difficult and dangerous places and I think it is very fitting to show them that we are all thinking and praying for them all the time . I don't see how there is any "lack of faith" in saying that. This is not some sort of competition to show how much emunah each of us has. Actually, Mr. Ben-David, the prayer is המצא לי פרנסתי בריוח ולא בצמצום בהיתר ולא באיסור בנחת ולא בצער. It does not include instructions how. Additionally, there is a basic difference between making parnossah through a job and being saved by the idf. A job is the lechatchila method of parnossah. The idf is, unfortunately sometimes a bedieved method of salvation. The fact that, as an integral part of the establishment of a state and army apparatus, religion had to be dropped, gives us a bad taste in the mouth when we have to utilize their services. Of course, there is currently no likely choice, but it feels wrong. Benefitting from the undermining of the Torah. The IDF is no more "bedi'avad" than using non-religous doctors, non-religious auto--mechanics and non-religious refuse collectors, all of which are vital for modern society. The IDF has always had religious soldiers and the fact that they were only a minority, particularly in the early years when there was too much influence by anti-religious officers (which has now ended) was due to the fact that the large religous population that existed in Europe prior to World War II largely opted out of the Zionist project and abandoned it to others with different values. If religous people don't like the way Israel has turned out (and don't include me in that group) they only have to look in the mirror to find the cause. The non-religiosity of the doctors is incidental to their medical knowledge. The non-religiosity of the infrastructure of the State of Israel is integral to its existence.That is the difference. "R. Slifkin: "Hashem, please help our soldiers and please bring our boys back home" addresses your points, 1 & 2, without precluding other possible ways of their being saved." "Rabbi Barry Kornblau of the RCA noted the organization’s disapproval of gun usage as expressed in its most recent resolution, extended only to those who use guns for recreational purposes." You see, when you practice with firearms "recreationally", you become more proficient in them, and then when you carry them, you can stop those who come to do evil against Jews, instead of crying for someone else to do it for you. Can I Put These In My Trunk? Happy 100th Birthday Daas Torah! And Life Goes On. But We Do Not Forget. What Does One Say At A Time Like This? "Founded on the Principles of Rav Hirsch"